It is a glorious summer: beautiful weather, cloudless blue skies, golden sunshine, and best of all – victory in that ancient international cricketing rivalry, the Ashes. Having lost to England during the northern summer of 2013, Australia was itching to get revenge back on home soil, and we did. For whatever reason, England failed to perform in Australia and had already lost the Ashes 3-0 by Christmas. The series finished 5-0 to Australia, only the third time in history such a whitewash has been achieved, and England lost all 10 wickets in every innings of the Test series – the first time either side has forfeited 100 wickets in Ashes history. Little wonder we celebrated wildly at the Fan Day at the Opera House yesterday, having taken down the team which was ranked #1 in the world and were favourites to win. 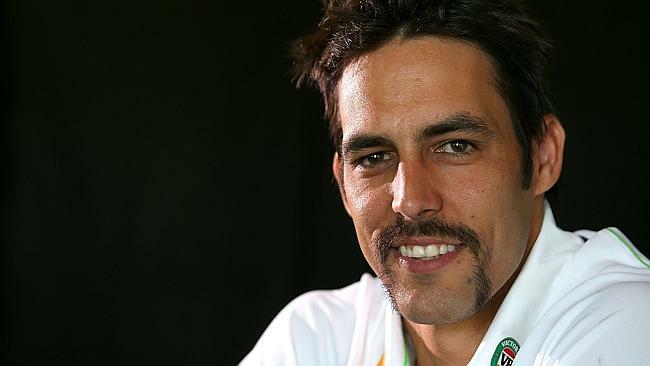 Mitchell Johnson was awarded Man of the Series, the fast bowler having taken 37 wickets – the most in an Ashes series in Australia since the late 1970s. Even more remarkably, this was a comeback with a vengeance, because not so long ago, Mitchell was battling injury, his self-confidence destroyed by the jeering of England’s fan base, the Barmy Army (a jingle about Mitchell Johnson is still their most popular song, and I use the word “song” extremely loosely). Quite apart from his Barmy Army-silencing performance (and I use the word “silencing” with great poetic licence), Mitchell’s value during the Ashes was as a psychological weapon, because he seemed to strike fear into the English batsman. His secret? Maybe it was his training, the confidence brought about by fatherhood, or a pep talk by a war hero, but nearly everyone was convinced it was his moustache. No, seriously. Mitchell grew a moustache for Movember to raise money for men’s health, but was urged not to shave it off at the end of the month by selector Mervyn “Merv” Hughes, who sports an impressive moustache himself. A public campaign and $10 000 donation from Gillette convinced Mitchell to keep the mo, and it seemed to work. I was following the Ashes on the BBC, and was interested to see how much that moustache affected the English: it was the “menacing mo”, “the terrifying tash”, “the malicious moustache”, “the fearsome face-fuzz”, or the “horrid horseshoe”, and Mitchell became the “pantomime villain”. Add one moustache, and suddenly this shy, quiet man had become a bowling nightmare to the English. Unfortunately, Mitchell says the magic mo must go for now, but confirms he will be growing it back when we take on South Africa later in the summer. I just hope it hasn’t lost its mystique by then. Mitchell is an English surname of several origins. It is said that the first people with this surname came from Mitcham in Surrey (now in the outer suburbs of London), with Mitcham meaning “big town, large settlement”. Mitchell can also be derived from the male name Michel, a Middle English nickname for a large person, meaning “big”. The Normans had the name Michel, but in their case it was a form of the name Michael. The surname Mitchell must have moved north during the medieval period, as it became particularly associated with Scotland. The Gaelic form of the name is based on the name Michael. In Ireland, Mitchell is used to Anglicise the Irish surname Ó Maoilmhichil, from the clan name Uí Mhaoilmhichil, meaning “devotees of the Archangel Michael”. The surname Mitchell is one very well known in Australia, for Sir Thomas Livingstone Mitchell was a 19th explorer of Australia. Originally from Scotland, he joined the British army, where he distinguished himself during the Napoleonic Wars, then became a surveyor in New South Wales. He explored New South Wales, Victoria and Queensland, and published two books which included close and sympathetic observations of the Aboriginal people he encountered. He is also remembered for the invention of the boomerang propeller, and being the last man in Australia to challenge anyone to a duel (both marksmen missed, so nobody was hurt). Many things are named after him, including the town of Mitchell and the Mitchell River in Queensland, the Mitchell Highway between Queensland and New South Wales, and Major Mitchell’s Cockatoo, a very beautiful bird with soft pink and grey markings, much admired by Sir Thomas Mitchell. Mitchell has been used as a boys name since at least the 16th century, and turns up early in Scotland. There are many men named Mitchell in Australian records, and lots of them emigrated from Scotland or have Scottish surnames. The name Mitchell has charted in Australia since the 1940s. It climbed gently until the 1980s (the decade when Mitchell Johnson was born), when it suddenly shot into the Top 25 from virtually nowhere. It peaked in the 1990s at #12, and is still stable in the Top 100. Currently it is #45 nationally, #77 in New South Wales, #53 in Victoria, #51 in Queensland, #41 in South Australia, #37 in Western Australia, and #91 in Tasmania. Australia is the only country in the world where the name Mitchell is still in the Top 100, and with the success of Mitchell Johnson, I don’t see it going anywhere soon. It’s an Australian modern classic with a lot of history, and a name we hold dear. Mervyn is derived from the Welsh name Merfyn, of uncertain meaning. It is sometimes said to be a variation of the Welsh name Myrddin (“sea fortress”), from whence we get Merlin, but it may mean “big”, and is often translated as meaning something along the lines of “famous to the marrow”. There was a medieval Welsh king named Merfyn. The name Mervyn was #66 in Australia in the 1900s, and peaked in the 1920s at #44 before declining and leaving the Top 100 in the 1950s. It hasn’t charted since the 1970s. It may be dated, but it is a uniquely Australian name, because in no other country (not even Wales) did it ever become popular. Two names more Australian than you might have thought – but which one do you prefer? Mitchell received a respectable approval rating of 68%, while people were less enthusiastic about Mervyn, with an approval rating of 22% – not one person loved the name Mervyn. I know little twins names Mervyn “Merv” and Montague “Monty”, older sister Matilda. Not really my style but crazy cute on two little curly haired rascals. Do you ever check the e-mail address attached to your comments, Sophia? All the time, how come?